1. Put a flat baking sheet in the oven and preheat to 180°C, gas mark 4. 2. Heat the oil in a frying pan. Add the onion, and fry gently until soft and golden. Remove from the heat and allow to cool. 3. Remove the skins from the sausages and place the meat in a bowl with the cooled onion, sage, apple and ground mace. Season well with sea salt and cracked black pepper. Mix to combine. 4. Roll out the pastry to a thickness of 3mm on a lightly floured surface to form a large 25cm x 36cm rectangle. Brush the pastry sheet with the beaten egg. 5. Pile the sausage meat mixture just off the centre of the rectangle in a long line. Fold the pastry over the top, pressing down to seal. 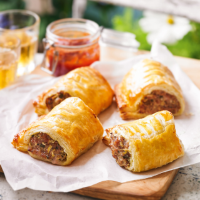 Trim off any excess pastry and cut into 4 sausage rolls. Slash the tops and brush with egg wash. Slide onto a baking parchment-lined sheet and place in the oven, on top of the preheated sheet, to bake for 45 minutes until golden and puffed, and the sausagemeat is cooked through with no pink meat. Allow to cool slightly before serving with salad, cheese and chutney. This recipe was first published in July 2016.